ENZYME PUMPKIN MASK: Pumpkin is a Rich NATURAL Source of Antioxidants and Enzymes that act like alpha-hydroxy acids. It has been known for Years that Alpha-Hydroxy Acids promote smoother younger looking Skin by increasing the rate of cell renewal. 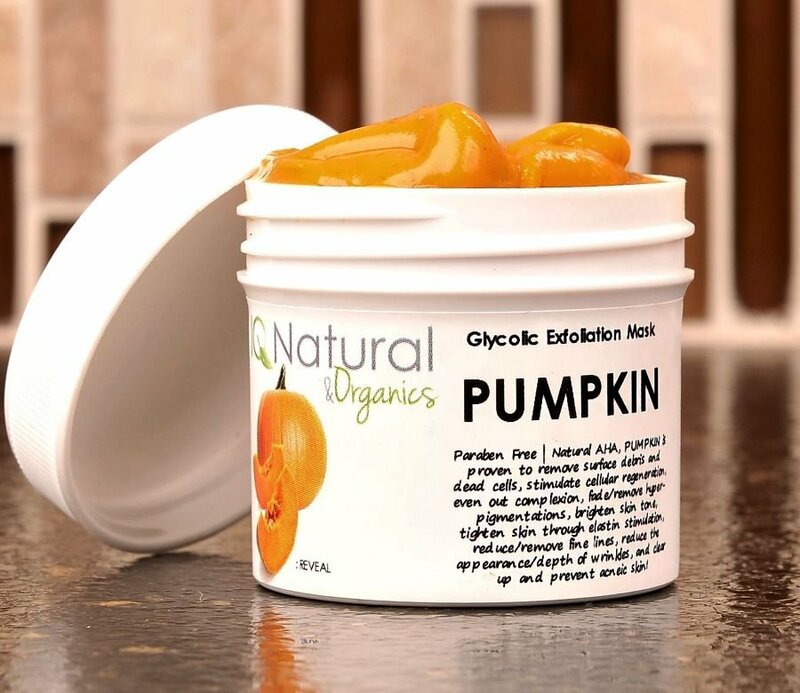 Our Pumpkin Peel will rejuvenate your face, hands, body and feet. The Glycolic Acid in our mask transforms dull lifeless complexions into youthful skin that radiates. Our Masks contain your choice of 5% 12% 15% Glycolic Acid that allows you to get a Professional Peel AT HOME !!! WHAT IS GLYCOLIC ACID? : Glycolic acid is perhaps the best-known of a group of natural ingredients called fruit acids or alpha-hydroxy acids (AHA). It is derived from sugar cane, so it is considered a natural product. Citric acid from oranges and other citrus fruits also fall under the same classification as glycolic acid. Glycolic acid works as an exfoliating agent because of its high acidity but easy solubility. Glycolic Acid goes under the damaged upper layers of skin and destroys the 'glue' which holds dead skin to the surface. As this dead skin is chemically burned off, the other ingredients carry the individual flakes away and a water rinse neutralizes the remaining acid. The result is a much-smoother skin surface and a more youthful appearance. A secondary benefit is glycolic acid's ability to draw moisturizers into the newly-exfoliated skin surface. DIRECTIONS: Skin Patch Test - Always do a skin patch test before applying the Glycolic Peel Solution. Choose a small area and dab on the peel solution. Watch the area for blistering and intense burning for about 2 to 3 minutes. There will be a mild burning and general redness. Apply a thin layer to cleansed skin, avoiding eye area or open wounds. Rinse off after five minutes or if irritation occurs rinse immediately. Light tingling will occur. If skin becomes irritated, wash off immediately with warm water and apply Jojoba Oil to face. Olive Oil work great to. Tone, nourish and protect. Always test product on small area before use on entire face. This product can irritate sensitive skin or skin that has open pores. Only you will know when to wash off the masque which should happen at the first sign of any irritation. Apply jojoba oil after making for cooling after the masque. WHAT ARE ALPHA HYDROXY ACIDS? : Alpha hydroxy acids are an entire family of acids, which can be derived from fruit, milk or sugar. These are most widely used in skin care products as an anti-aging agent. These can be found as glycolic acid (made from sugar) and lactic acid (made from milk). These Alpha hydroxy acids are also called fruit or citric acids. ACNE: If you are using this product to control acne, remember that your acne will appear worse before it looks better. Simply because the dead skin layers are peeled from the face and the acne is brought to the surface. This will actually accelerating the healing process. In this case, dont be discouraged and continue recommended use to see improvement. YOUTHFUL SKIN REVEALED: By removing the top layer of skin with the glycolic peel you will uncover the freshly produced skin with a youthful texture and glow. Acne, Sun Spots and a host of other skin issues become less of an issue for you.